Born - About 1895 at Panteg, Monmouthshire. Died - 22nd May, 1922 - died form health deterioration after military service. Husband to Mrs Blodwen Evans, Wern Crescent. Buried at Beechgrove Cemetery, Edwardsville, Glam. Wallace John Evans survived the horrors of the First World War, but, just like so many other men who came home, the effects of The War were to lead to his early death and, in Wallace’s case, only a few years after the war ended. 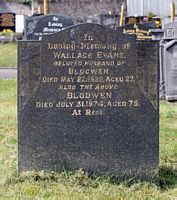 His wife Blodwen survived Wallace and lived until 1974. As can be seen from the photo, they are buried together, re-united after 52 years. Percy James Evans, born about 1900 in Cilfynydd. In 1911 they were living at “Woodville”, Shingrig Road, Nelson. Both William and Wallace were dairymen, like their father, while Percy was still at school. In the summer of 1920, Wallace married Blodwen Rees. The below information is taken from editions of the Merthyr Express for the dates shown. We regret to record the death in the early hours of Monday morning of Mr Wallace John Evans, Woodville, Shingrig Road, Nelson after a long illness patiently borne. Deceased was only 27 years old and was highly respected by all sections of the community. During the great was he served in France and later in Germany with the Royal Engineers, and there can be no doubt that his health was seriously undermined by his military service. He was married less than 2 years ago to Miss Blodwyn Rees, Wern Crescent, and to her and the sorrowing parents and family the sympathy of all is sincerely extended. He was buried in Beechgrove Cemetery on Thursday 25th May 1922. Wallace John Evans was a native of Panteg, Monmouthshire, but had lived in Nelson for 15 years and could thus be called one of Nelson’s young men. During the war he served with the Royal Engineers in France and after the armistice was stationed for 11months at Cologne, Germany. Prior to enlisting he enjoyed perfect health, but shortly after receiving his discharge, he began to suffer with a hacking cough, which was attributed to the rigour of his military service. On his return home he secured an appointment as manager of a dairy business at Treforest and whilst there his marriage took place to Miss Blodwyn Rees, daughter of Mr and Mrs Evan Rees, Primrose Villa, Nelson, at Llantwit Fardre Parish Church in September 1920. After a few months at Treforest his health gradually began to get worse and he returned home to Nelson.